Hydrogen embrittlement, an environmentally assisted form of corrosion, can be considered as one of the most dangerous phenomena affecting mechanical properties of the metals, able to produce either a loss of ductility or time-delayed fractures, even without any externally applied stress. Presently this phenomenon is not completely understood and hydrogen embrittlement detection, in particular, seems to be one of the most difficult aspects of the problem. The aim of this study was to verify the hydrogen embrittlement detection capability offered by the XRD Residual Stress Determination Technique. For this scope, steel AISI 4130 samples were hydrogen charged and their superficial residual stress was measured before and after the charging process. The results showed a lowering of the compressive stress for the hydrogen charged samples, with a surface compression decrease proportional to the strength of the hydrogen charging treatment and in agreement with the hydrogen embrittlement expected effect. The reliability of this new ND technique was also compared with metallographic inspection, mechanical tests and electronic microscopy. Metallic materials are often submitted to extremely hard work conditions, mainly in fields such as the aeronautical one, where high performances and the capability to sustain very intense stresses are required. Phenomena which can affect mechanical properties of the used materials have therefore a great importance and a particular attention must be given to their origin and their effects on the metals. 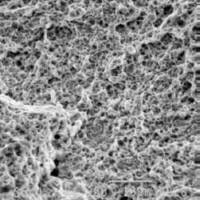 Hydrogen embrittlement, an environmentally assisted form of corrosion, including several corrosion mechanisms, can be considered one of the most dangerous phenomena affecting mechanical properties of the metals, able to produce either a loss of ductility or time-delayed fractures, even without any externally applied stress [1- 3]. Atomic or nascent hydrogen may act as a crack growth initiation causing serious in-service problems; frequently the cracking involves a delay time due to the diffusion and accumulation of hydrogen at critical sites [4, 5]. In the aeronautical field hydrogen embrittlement has often been observed in dealing with high-strength steel. Failures and accidents, attributed to hydrogen embrittlement, have been reported on high-strength steel landing gear components at low applied cycles of stresses . Hydrogen is a problem in steel because it is highly mobile as an atom or screened ion and can both diffuse through the lattice and be transported by the movement of dislocations, interacting with the material in many ways that involve precipitates, inclusions, grain boundaries and other imperfections in the lattice [7-9]. Moreover, in higher strength steels, comparatively small amounts of hydrogen lead to large changes in properties with respect to steels with lower strength . Hydrogen embrittlement can occur during many production and maintenance processes carried out on metallic structures in order to enhance their operational life . These treatments include cadmium, chrome and nickel electroplating, the use of suitable corrosion inhibitors affecting the absorption and the recombination of the hydrogen atoms adsorbed on the metal surface, acid surface pickling to eliminate oxide coatings. Due to their frequency in maintenance activities, even some washing operations could be considered dangerous. Despite its importance this phenomenon is not completely understood yet and hydrogen embrittlement detection, in particular, seems to be one of the most difficult aspects of the problem; although much progress has been made, current ND techniques are unable to detect preliminary hydrogen embrittlement and to establish further embrittlement degrees, reached during the above mentioned processes, in order to prevent their dangerous effects. The main purpose of this study is to verify the hydrogen embrittlement detection capability offered by the X-ray Diffraction (XRD) Residual Stress Determination Technique. In XRD Residual Stress measurements, the strain in the crystal lattice of a crystalline sample is measured, and the residual stress present in the material and producing the strain is calculated assuming a linear elastic distortion of the lattice [11-14]. This method allows to evaluate nondestructively both macroscopic and microscopic residual stresses with spatial and depth resolution orders of magnitude less than other methods . XRD technique has been often employed to control the surface and sub-surface residual stress distribution of metallic components and structures undergone to external applied stresses and to study the effects, on the residual stresses, of different manufacturing processes [16, 17]. Residual stresses are, in fact, just as important in the function of a part as are externally applied forces. An individual grain, or crystal, of metal in a part reacts to a stress to which it is being subjected whether the stress is from an external or an internal source; a stress from either kind of source can result in serious problems of fracture and distortion. Nevertheless it is a big mistake to think that all residual stresses are harmful. Indeed, there are a number of manufacturing processes, like shot-peening and surface rolling, in which the sole purpose is to introduce favorable residual stresses in critical parts, while there are metal treatments, like grinding and welding, that must be carefully controlled in order to prevent unfavorable residual stresses [18, 19]. Actually, trapped hydrogen operates inside the metal by producing a stress field, modifying the original residual stress patterns and, if this phenomenon is combined with a corrosive environment and externally applied cyclic loads, the life of the component dramatically changes and it seems to be unpredictably decreased. The aim of this work is just to verify the possibility to investigate residual stresses variations, introduced in high strength steels by hydrogen embrittlement, using the XRD Residual Stress Determination Technique. For this purpose, steel AISI 4130 samples were hydrogen charged and their superficial residual stress was measured before and after the charging process. The reliability of this new non-destructive method was also compared with electronic microscopy inspections and mechanical tests. The material selected for this study was the AISI 4130, a steel with optimum workability and mechanical properties, widely used in aircraft components such as landing gears, engine mounting lugs, shafts, fittings, bolts . 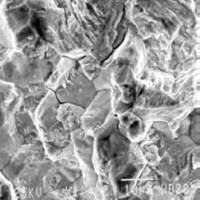 Hydrogen embrittlement of high strength AISI 4130 has been noticed after electroplating and pickling processes. Six different groups of specimens were prepared and used in this study: their characteristics and thermal treatments, in addition to their identification marking, are summarized in Table 1. Table 1: Identification marking, characteristics and treatments of the investigated specimens. Thermal treatments were chosen to achieve hardness values in agreement with the most common values found on the investigated AISI 4130 aircraft components. A and B specimens were both rectangular: B group was different from A only for the smaller dimensions required by the automatic polishing performed in order to reach a better reproducibility of the specimen surfaces. B' and B" specimens, prepared from B group, were used for preliminary mechanical tests: B' configuration was in accordance with UNI Standard 552 and prEN Standard 10002-1 for Proportional Flat Specimens, while B" configuration was in accordance with ASTM Standard E 466-96 for Continuous Radius Flat Specimens [21, 22]. C' and C" groups were specially prepared to perform mechanical tests, after XRD residual stress measurement, on hydrogen charged and uncharged specimens. Thus C' configuration was the same of B', while C" configuration was in accordance with ASTM Standard E647-95a for Middle Tension Notched Specimens [23, 24]. Moreover, because of the use of void conditions during heat treatment, only a soft plastic media blasting (PMB) was needed to remove the oxide from C' and C" specimen surfaces. The specimens submitted to XRD control for surface residual stress pattern determinations were hydrogen charged following the different processes described in Table 2. Table 2: Identification marking and conditions of the different hydrogen charging processes. Thiourea CS(NH2)2 was used because of its ability, at the right concentration, in promoting hydrogen atoms absorption by exerting a blocking action on recombination of hydrogen [25-28]. H1 and H2 charging processes were carried out by simply dipping the samples in acid solutions while H3 - H7 processes were performed by means of a galvanostatic polarization carried out using a potentiostat Solartron SI-1287. The effective hydrogen absorption of the specimens was checked by an hydrogen analyzer Leco Corporation RH-402. Using steel standards with a certified hydrogen content (1± 0.1 ppm and 5± 0.2 ppm), an hydrogen increase from 2 ppm to 5 ppm was observed on charged specimens according to the strength of the treatment. A Rigaku Diffractometer mod. Strainflex MSF-2M/PSF-2M, equipped with a Cr X-Ray tube (l = 0.2289649 nm) and a NaI scintillation counter, was used for residual stress measurements; the standard irradiated area was 4×4 mm2, although, for measurements on shorter specimens or at particular points, a narrower 2×4 mm2 area was selected by means of a suitable irradiation mask. X-rays depth of penetration, function of the wavelength and the incident angle of the beam, was about 5 m m. Surface residual stresses were measured longitudinally along the whole middle line of the specimens at intervals of 0.5-1.5 cm. Moreover, except for the A group, XRD analyses were carried out on the same specimen before and after the hydrogen charging process, to avoid unexpected differences between the initial residual stress values of the uncharged samples; the results were then expressed as stress variation (D MPa) in order to underline the differences. The XRD technique used was the sin2y technique ; the selected y 0 angles were y 0 = 0°, y 0 = 10°, y 0 = 25°, y 0 = 40°, while the diffraction plane investigated was that suggested for a -Fe measurements when a Cr X-Ray tube is used [15, 29]: Miller indices (hkl) 211 and diffraction angle 2J @ 156.0°. Mechanical tests were carried out according to the suitable Standard for each specimen configuration (see Specimens section). Characteristics and parameters of the tests are summarized in Table 3. Table 3: Characteristics of the testing machines and main working parameters used for the performed mechanical tests. R = Pmin/ Pmax : load ratio; f : cyclic frequency. **	Pmax= 40% of tensile strength Rm. ***	Pmax = 70% of Rm. In this test a fatigue precracking was performed using a Pmax increased of 15% (Pmax = 32.8 KN); crack lengths were measured using penetrating liquids and a visual system capable of resolving a crack extension of 0.008 mm. The Electronic Microscope Joel JSM-840 was used to verify the effects of the hydrogen charging processes and to inspect the fracture surfaces of the specimens undergone to mechanical tests. The working conditions were: 25 KV, resolution 4-10 nm. Table 4: XRD residual stress analyses of five A specimens. From these XRD data it seems evident that all the hydrogen charging processes cause a modification of the residual stress of the samples: in particular, the XRD technique detects a decrease of the surface compression on charged specimens. An analogous behavior has been observed also for B and C type specimens. Figures 1 and 2 show, respectively for the B group (B, B', B") and the C group (C', C"), surface residual stress variation (D MPa) as a function of the hydrogen charging process. In this case, as mentioned above, each specimen was measured before and after the charging process: histograms in fig. 1 and 2 represent the mean stress variation and its error range of three replicates for each charging treatment. Fig 1: Mean residual stress variation (D MPa) and error range (3 replicates) of the B type specimens as a function of the hydrogen charging process. Fig 2: Mean residual stress variation (D MPa) and error range (3 replicates) of the C type specimens as a function of the hydrogen charging process. As for the A group, XRD measurements on B and C specimens show again that hydrogen charging always cause a decrease of the surface compression. Actually, these results are in good agreement with the hydrogen embrittlement expected effects. In fact, a lowering of the surface compressive stress often means a reduction of the mechanical properties of a steel, while it is usually desirable to have high compressive residual stresses at the surface of parts that are subjected to fatigue, stress corrosion and fretting [30, 31]. Changing time or current density of the polarization during the charging process seems to produce only a slight difference of the compression decrease, both for the abrasive belts polished specimens (B, B', B") and the harder (HRC = 45) plastic media blasted specimens (C' , C"). On the contrary, higher stress variations have been observed for the specimens charged by simple dipping into H2SO4 solutions, although these charging treatments can be considered less hard than cathodic polarization. Probably this apparent discrepancy can be explained considering that a contemporary corrosion phenomenon occurs in H2SO4 solutions when the specimen, unlike polarized samples, does not work as a cathode (H1 and H2 processes). In this case the effective layer of material analyzed after hydrogen charging is quite different from the original one taken as a reference, because of the surface etching, and this represents a contribution affecting the total stress variation measured by XRD technique. Mechanical tests and microscopy inspections confirm hydrogen penetration into the model specimens. Table 5 and 6 show the results achieved in mechanical experiments carried out on B' and B" samples. In these preliminary tests only a simple comparison between an uncharged specimen and a polarized specimen (H4 process) was considered. Tensile test shows only minor hydrogen effect on tensile strength and a more pronounced influence on the ductility at fracture; fatigue test suggests a reduction of 35% of the fatigue life for the charged specimen. Table 6: Comparison between the fatigue tests of an uncharged and a charged B² specimen. * tR: time of rupture; N: no. of cycles at rupture. Table 5: Comparison between the tensile tests of an uncharged and a charged B' specimen. * A: % elongation at fracture; Z: % reduction of area; Rm: tensile strength. A similar trend has been observed also for mechanical tests performed on C' and C" specimens. Tensile strength is nearly unaffected by hydrogen while a major degradation occurs for ductility and fracture strength. Figure 3 reports the effect of the different charging process on the fracture strain and the reduction of area of C' specimens: the extent of ductility reduction seems to be quite consistent with the strength of the hydrogen charging, except for the inversion of the values concerning H5 and H6 processes. In the same way fig. 4 shows, for C" specimens, a decrease of the critical stress intensity factor KIC  as a function of the hydrogen treatment: cracks of progressively minor length can be stood by charged specimens without rupture, because of the occurred embrittlement of the metal, even if, in this case too, a simple change of the time of charging treatments (H5 and H6 processes) slightly affects the specimen properties. SEM analyses, carried out at the surface fracture, confirm mechanical results: an increase of intergranular brittle areas (fig. 5) respect to the classic dimples (fig. 6) of the ductile rupture was observed on charged specimens in good agreement with the strength of the charging treatments. Fig 5 (left): Surface fracture of a C' specimen hydrogen charged with H2SO4 0.5 M + Thiourea 10-3 M + cathodic polarization -30 mA/cm2, 1h (H5 process). Fig 6 (right): Surface fracture of an uncharged C' specimen (H0 process). XRD Residual Stress Determination Technique seems to be able to detect hydrogen embrittlement in high strength steel. In fact, in all the investigated cases, XRD technique detects a decrease of the surface compression on hydrogen charged specimens and this is in agreement with the expected effects of the embrittlement phenomenon, because a lowering of the surface compression often means a reduction of the properties of a steel, as confirmed by mechanical tests and SEM analyses. From the results achieved till now, anyway, XRD technique seems not to allow a quantitative relation between the surface stress variation detected and the strength of the hydrogen charging treatment. Compression decrease, even if always measured, is quite restrained and does not seem to be strictly proportional to the occurred hydrogen embrittlement and then to the modifications of the mechanical characteristics of the metal. In addition, the combination of corrosive environment and hydrogen charging process (as for non polarized specimens) makes the problem even more complicated, operating in the metal a noticeable reduction of the residual compressive stress but not allowing to distinguish between the contribute of the hydrogen embrittlement from that of the etching of the outer layers. The present work leads to the conclusion that XRD technique can be effectively used as a preliminary ND test to check residual stress variations of aircraft high strength steel components which are suspected of hydrogen embrittlement. Whenever a not negligible surface compression decrease is detected by XRD technique, qualification destructive tests should be carried out to verify the real effect produced by hydrogen on mechanical properties of the metal, in order to obtain safer results for the reliability of the aircraft structures. Authors wish to thank Cap. D. Ruggieri of the Centro Sperimentale Volo - Reparto Chimico for his technical assistance in microscopic inspections and the Dipartimento di Ingegneria Aerospaziale, Università di Roma "La Sapienza", for the support given during fatigue tests. Metals Handbook, Vol. 13, Corrosion, ASM, Metals Park, Ohio (1994). W.W. Gerberich: Fatigue in Hydrogen Degradation of ferrous Alloy, ed. by R.A. Oriani, J.P. Hirth, M. Smialowski, Noyes Publ., New Jersey (1985), p. 366. H. Vehoff: Hydrogen Related Material Problems in Hydrogen in Metals III, ed. by H. Wipf, Springer-Verlag, Berlin (1997), pp. 215-278. N.R. Moody, M.W. Perra, S.L. Robinson: Metallography of Advanced Materials. 20th Techn. Meeting of Int. Metall. Soc., Monterey, Cal., USA (1987), p. 177. A. Turnbull, H.W. Pickering, A. Valdes: in Embrittlement by the Localized Crack Environment, ed. by R.P. Gangloff, AIME Warrendale (1984), pp. 3-49. Z.P. Marioli-Riga, A.N. Karanika: Combined Effect of Hydrogen and Corrosion on High Strength Aircraft Structures under Stressed Conditions. RTO Meeting Proc. 18 (1999). H. Wipf: in Hydrogen in Metals III, ed. by H. Wipf, Springer-Verlag, Berlin (1997), pp. 1-4. J. Wang, H. Vehoff: Scripta Metall. 25, 1339 (1991). A. Kimura, H.K. Birnbaum: Acta Metall. Mater. 38, 1343 (1990). C. G. Interrante: Basic Aspects of the Problems of Hydrogen in steels. ASM, (1982), pp. 3-16. B.D. Cullity: Elements of X-Ray Diffraction. Addison Wesley, 2nd Ed., (1978). I.G. Noyan and J.B. Cohen: Residual Stresses. Measurement by Diffraction and Interpretation. Springer-Verlag (1987). H.P. Klug and L.E. Alexander: X-Ray Diffraction Procedures for Polycrystalline and Amorphous Materials. Chapter 11, pp. 755-789. Wiley Interscience, 2nd ed., (1974). H. Behnken, W. Pfeiffer: in Structural and Residual Stress Analysis by Nondestructive Methods, ed. by V. Hauk. Elsevier (1997), pp. 39-215. P.S. Prevey: X-Ray Diffraction Residual Stress Technique. Metals Handbook, Vol. 10, ASM, 9th ed., pp. 380-392. (1986). W.P. Koster: in Practical Applications of Residual Stress Technology, ed. by C. Ruud. ASM International Conference Proceedings, Indianapolis (1991), pp. 1-9. P.S. Prevey: in Practical Applications of Residual Stress Technology, ed. by C. Ruud. ASM International Conference Proceedings, Indianapolis (1991), pp. 47-54. D.G. Wulpi: Residual Stresses. Chapter 7, pp.63-83. ASTM (1988). B. Scholtes : in Structural and Residual Stress Analysis by Nondestructive Methods, ed. by V. Hauk. Elsevier (1997), pp. 590-636. K.R. Brown: in Aerospace Structural Metals Handbook, Vol. 1, Cindas Purdue University (1997). UNI St. 552: Mechanical Tests of Metallic materials (1986). ASTM St. E 466-96: Conducting Force Controlled Constant Amplitude Axial Fatigue Tests of Metallic Materials (1996). ASTM St. E 647-95a: Measurement of Fatigue Crack Growth Rates (1995). R.D. McCright: Stress Corrosion Cracking and Hydrogen Embrittlement of Iron Base Alloys. NACE, (1973), pp. 306-325. J.C. Lin, R.Y. Lue, J.S. Wu, S.L. Lee : EIS of Carbon Steel in 0.5M NaCl Solution Containing Al3+-Thiourea. Conf. Proc. of 8th SEIC, Ferrara (1995), pp. 123-129. S. Brinic, Z. Grubac, R. Babic, M. Metikos: Study of the Thiourea Adsorption on Iron in Acid Solution. Conf. Proc. of 8th SEIC, Ferrara (1995), pp. 197-205. P. Marcus, J. Oudar : Gas-Iron Surface Equilibria in Hydrogen Degradation of ferrous Alloy, ed. by R.A. Oriani, J.P. Hirth, M. Smialowski, Noyes Publ., New Jersey (1985), p. 36. Rigaku Corporation: Instruction Manual for Strainflex MSF-2M/PSF-2M. Rigaku (1989). E.B.S. Pardue, R.H. McSwain: X-Ray Diffraction Stress Analysis as an NDE Technique. TEC publ., Knoxville Tennessee (1994). R. Capriotti, F. De Paolis, G.P. Marconi, P. Silvestri, G. Trivisonno: Il contributo della Tecnica XRD nello Studio dell'Integrità Strutturale delle Palette per Turbogetti. AIPnD Conference Proc., Padova (1997), pp. 255-267.